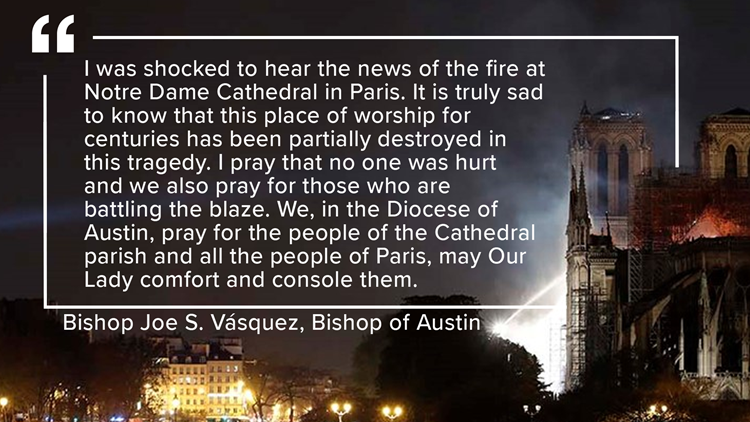 After an icon within the Catholic world caught on fire Monday, KCEN Channel 6 asked Central Texas Catholics how the global community should move forward from the blaze. WACO, Texas — A Parisian icon has stood for roughly 800 years. Monday, it was in flames. The famous Notre Dame Cathedral in Paris, France, endured a fire that threatened the Catholic icon and the priceless relics inside. "There's a lot of history, there," Father Daniel Liu, director of St. Peter's Catholic Student Center in Waco, said. "When I saw the news this morning, you kind of think, 'Oh my gosh, is this real?'" Liu said he, like other Catholic worshipers around the world, was shocked to see the harrowing images out of Paris. "The world, it changes," Liu said. "The world passes away, even our bodies pass away. But, we do respect things in the material world that are sacred. People are sacred, but also places can be sacred, so we set things apart to remind us that God did enter into this world, He touched this world." Luke Pederson, an undergraduate student at Baylor University, said he visits the student center. He spoke about what the Notre Dame Cathedral means to him as a Catholic. "It expresses the devotion of the medieval world to the Catholic faith," Pederson said. Flames could be seen shooting from the roof of the church, leaving many to wonder whether the historic Catholic icon and its priceless relics, including the Crown of Thorns, would be lost forever. "That ceiling is a beautiful, heavy stone vault," Michael Tinkler, a professor of Art History at Hobart and William Smith Colleges in New York, said. "The thing is, they built those to fireproof those buildings in the middle ages because lots of medieval churches burned." As the Catholic world united in faith, Father Liu said he's confident its trust in God will keep them together.